Why rent a private villa? Private villas are not the exclusive domain reserved for the rich and famous. Our collection of villa’s will make you feel like a rock star without paying as one. Villa rates vary depending on the season and sometimes the number of guests. So if you are planning a getaway with friends or family, there is typically just one price to split between everyone. The rate typically includes the villa, all of its amenities, and in some cases, a dedicated staff. With several families or couples traveling together, even the most luxurious villas can be a more economical option than hotels. A private villa will typically be less expensive per person, offer you more space, privacy and welcoming comfort than a hotel room. Do you want a “cloned” hotel room or a luxury villa experience? Villas come in all shapes and sizes across the world's most desirable destinations, so finding the right one is never a problem, wherever you want to go. You can enjoy the breathtaking sunset in Bali, experience the rich culture in Thailand or simply relax by the beach in Seychelles. Every villa has a unique charm and character that just can’t be cloned! What’s a typical size of a villa? An average hotel room is 325 square feet. Compare that with an average vacation rental of 1,850 square feet. Do I have to sign up and be a member to rent? There is no membership fees, no blackout dates. Just browse through our website and choose a villa that you like, send us an inquiry and we can start the exciting journey of matching you up to a villa with the experience that you are looking for. What is the cost to rent a villa? There is a villa to suit every budget. We offer private villas starting from US$300/per night to exclusive private island from US$25,000/per night and everything in between. Are there any restrictions with children? That depends on the villa that you’ve chosen. Some of the villas will restrict children due to safety concerns. There are some villas that are clearly meant for honeymooners and therefore require privacy and serenity. If you are traveling with children, its best to inform us as before booking. Is there a minimum night stay? Sometimes, depending on the region, season and villa owners. For example, European villas typically require a 7 night minimum. During peak holiday periods, 10 - 14 night minimums are often the norm around the world. Do you offer courtesy hold for a villa? Yes, depending on the circumstances we can offer a courtesy hold of 48 hours, often without any financial obligations. Is there a daily meal charge? 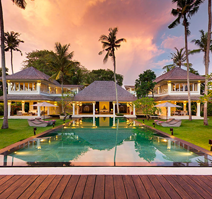 Some villas include a chef, while others may have a half board or full board options (particularly in the Seychelles and Maldives). Meal options vary on the villa and destination. Some villas will offer basic start up amenities for your convenience. If you require additional groceries, villa staff can stock up the fridge and present you a food bill at the end of your stay. Some villas are completely self catered. What about a private chef? Most of our villas have the option of adding the services a private chef and some include a chef in the rental cost. The cost to hire a private chef varies by destination. Are the villas equipped with air conditioning? That depends on the location and time of the year. Some villas offer central air conditioning while others may have additional fans to cool the villas. Do the villas have a private pool? The vast majority of our villas have their own private pools. Occasionally, some may be shared with other guests if the villa is located within a group of other private villas. Are cribs available in the villas? It’s best to let us know if you do need a crib as some villas will already have them available. If not, arrangements can certainly be made to accommodate our young guests. Is it possible to include additional guests later? Yes, if there is sufficient room in the villa. If there is a per guest or per bedroom rate, you will be charged for the additional costs. Can you clarify the rental rate for the villa? The rental rate is dependent on destination, season and the owners. Some villas charge a flat rate for the entire villa either on a per night or per week basis. In certain destinations, for example the Seychelles, the weekly rate is based on the number of guests or rooms occupied in the villa. However, its good to note that the unoccupied rooms are never rented out to other guests to ensure your privacy and enjoyment. Again depending on the destination, the low and high seasons dictate the rates offered by the villa. 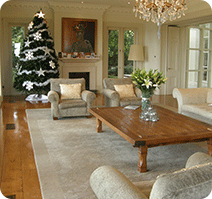 Easter, Christmas and New Year are popular dates, often priced at peak rates and most villas are booked up months in advance during these periods. Are there any hidden fees that I should be aware of? The villa rental does not include food cots (unless there is a meal plan included), transportation, recreational activities, tax or gratuities. Our villa rental agreements will make clear what is included or not included in the rental price. What about vacation insurance to cover costs in case of bad weather? We recommend clients make their own vacation insurance arrangements. Refunds are only given if the villa is rendered unlivable or in exceptional circumstances. How do I organize transportation for my holiday? We offer our clients full concierge service and are happy to assist you in any way possible. Some of our premium villas will include complimentary transfer to and from the airport. What if I need to buy groceries? Our villas can be pre stocked with a list you provide before arrival. Some of our villas do provide guests with basic essentials such as milk, bread, etc at the start of your stay. Additional groceries can be purchased by the villa manager/house manager. Just give them a list and they will be more than happy to assist. Most villas have grocery stores nearby. Do you offer discounted weekly rates? Discounts are given at the discretion of the property owner and we will also promote villas if they are on a special offer. Discounts may also be considered for stays longer than 14 nights and will be evaluated on a case by case basis. How much privacy will we have around the property? Most of our properties are as secluded. Surrounded by land, lush gardens or tropical beaches providing guests with a lot of privacy. Some resort community villas may be attached to the main resort, but remain private units for you and your guests only. How far is the beach? Walking distance? That depends on the villa. The beach may be private and right outside your door, a short drive away, or a short walk. Is there any night life? How far away? That depends on the villa and its location. Some villas are fairly secluded from the main strip, in order to give you maximum privacy and space to relax. Or, you may choose to rent a villa right in the heart of town that is close to bars and restaurants. Who cleans the villa? Is the maid included? Nearly all villas have a maid included in the price listed, and frequency depends on the individual properties; please check the villa pages for all the details. Most, if not all villa’s have TV connections, but channels vary depending on the location. Please refer to the appropriate villa page for additional details. Do you have any villa suggestions (e.g. where we can play golf)? 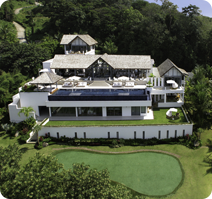 Yes, we do have villas that will provide you with easy access to golf or other fun activities. Please visit the appropriate villa pages for all information concerning the different activities offered in the area. A villa specialist can also suggest a number of villas suitable for the kind of holiday you're looking for. 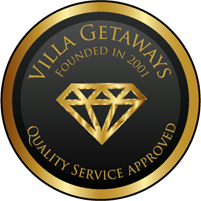 Please visit our website to see some of our featured villas or special promotions. You can also sign up to our newsletter to keep up to date on new properties and hot destinations. Our villa specialists are also always available to make recommendations based on your specific needs. Most of our villas have Internet access; connection speed, costs and equipment available varies. Please visit the appropriate villa page for all information. Please visit our website if you wish to have a hard copy fact sheet to share with your family and friends. With a simple click of a button, you can print a PDF format brochure of the villas that you are interested in. Who would be our contact for anything we may need while we are there? Depending on the villa, there might be a property manager or owner who lives on the property or very close by. In many locations we have our own team on the ground, and our support team is available 24/7 if you need our help. Is the photo on the website the exact villa we would be staying in? Yes. All of our villas have their own pictures that represent that exact property, excepting a very small number of resort units that resemble each other. Will it be possible to renew our wedding vows? Can you help with arrangements? 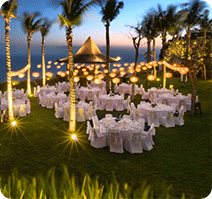 Wedding ceremonies are possible depending on the villa and the location. There are several romantic villas in various locations that would be perfect for such a special occasion. Of course, our villa specialist are happy to recommend a villa. We can also have a local wedding coordinator get in contact with you to organize the details. Can you provide references from previous guests who stayed at the villa we are interested in? Yes, simply ask one of our villa specialists for references and we can put you in touch with a client who has stayed with us before.